ST. GEORGE – People run for many different reasons. Some run for fitness, some for peace, some run for the challenge and still others run for sheer fun. Saturday at Desert Hills High School runners of every type and preference will rally together and run for a cause. Created by Millie’s Princess Foundation and hosted in honor of 5-year-old Taleah Stevenson who is battling acute lymphoblastic leukemia, the Millie’s Princess Run 5K, will see runners, walkers and supporters don princess (and prince) garb all in order to raise funds to help the Stevenson family offset the costs of fighting cancer. “Because childhood cancer is a royal pain.” That is the motto of Salt Lake City-based nonprofit Millie’s Princess Foundation, which was formed in 2013 and named after Millie Flamm, a Utah girl who lost her battle with leukemia that same year. The race was a big success financially but even more than that it showed the Flamm family how many people loved and supported them.The first Millie’s Princess Run was held in 2012 while Millie Flamm was in the hospital undergoing a bone marrow transplant. The race was organized by a group of women in Millie Flamm’s neighborhood that wanted to show their support and help the Flamm family with the astronomical costs of cancer treatment, said Amanda Flamm, Millie’s mother. “It was just life-changing to see the love and support,” said Amanda Flamm. After the success of the 2012 race, organizers, including the Flamm family, wanted to hold a 2013 race to benefit other families with children who were fighting cancer and this time Millie Flamm was to attend; but, unfortunately, she passed away a week before the run. Nearly 800 friends, family members, runners and supporters held the race with Millie Flamm close to their hearts and soon after requests came in to hold races in other locations and that was the birth of Millie’s Princess Foundation. In addition to the Salt Lake City and St. George races, the foundation has future plans to hold races in Chicago, Phoenix, New York City and Dallas. Taleah Stevenson of St. George has spent more than half of her 5-year-old life battling acute lymphoblastic leukemia. 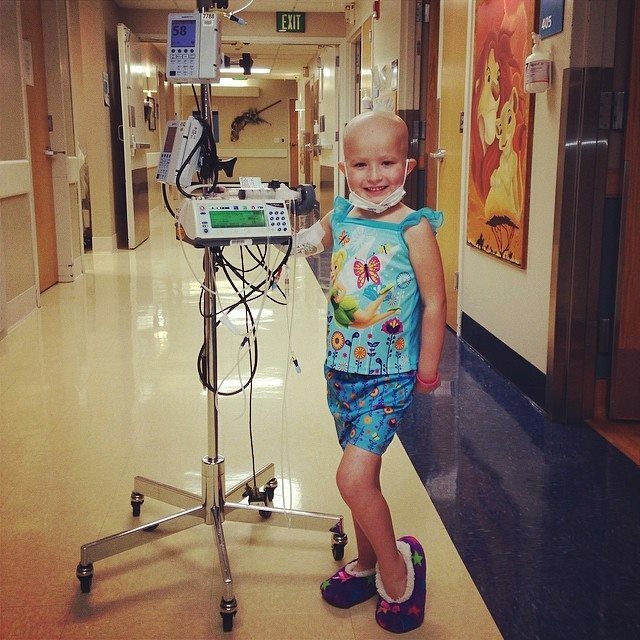 Diagnosed as a toddler, she underwent two years of treatment that were completed in October 2013. The family celebrated with a big party and life seemed to return to normal until March 25 when it was discovered that she had relapsed, the cancer had returned. Taleah is now fighting cancer a second time with even more aggressive treatment including a bone marrow transplant. She has three younger siblings, a brother, Slade, 3, and boy and girl 6-month-old twins, Sloan, her brother, and Tait, her sister. As preparations for the bone marrow transplant were being made each of Taleah’s siblings were tested to see if they could be the donor. Though chances were slim – there is a 25 percent chance of siblings being a match – her younger sister Tait is a match. The transplant is scheduled to take place on June 16 at Primary Children’s Medical Center in Salt Lake City. Taleah will spend six weeks in the hospital. After she is released, the family will have to spend the next 100 days in Salt Lake City in order to be near the hospital for continued monitoring and testing. Additionally, Taleah will be on a restricted diet and have limited interaction with the outside world while her immune system recovers. Despite all these hardships, Tosha Stevenson said that her daughter is handling things really well and just hopes to one day be able to do all the things kids her age are doing like going to school, swimming and playing with friends. Local race organizer Dani Prince, another cancer mom, met the Stevensons while her own son, Chase, was in treatment for the same cancer. Both Chase Prince and Taleah Stevenson finished their treatments together last October and the families became friends and a source of support to one another. When Taleah Stevenson’s cancer relapsed Prince knew that she had to do something so they decided to hold the princess race to help the Stevenson family financially and to let them know they are not alone. “I hope everyone turns out for them, for her,” Prince said. For Tosha Stevenson, the support means a lot to her family and to all the families who are going through the same situation. Millie’s Princess Foundation will hold its first St. George race Saturday at Desert Hills High School. It will feature a 5K and several children’s races along with other activities that include face painting, food vendors, princesses, Star Wars characters, a photo booth and much more. Runners are encouraged to register online but registration will also be available at packet pickup Friday at Christensen’s Department store on Bluff Street from 6-8 p.m. and on the day of the race starting at 7 a.m. It is an untimed event designed to encourage participation from everyone. Nonrunners are invited to come participate in the after-race festivities, enjoy the booths and purchase food from the vendors all of who are donating their profits to the Stevenson family. The race starts at 8 a.m. and the festivities and childrens runs will begin around 9 a.m. and continue until approximately noon. St. George Fire Department will be on hand to spray down hot runners, children and attendees and Paul Mitchell the school will be doing princess updos. Everyone is asked to dress up like a prince or princess and rally around the Stevenson family in love and support. How to register: Runners can register online, at packet pick up Friday from 6-8 p.m. at Christensen’s Department Store, 761 S Bluff St, St George, or on race day at 7 a.m.